Flash Page Flip is a ready-to-use SWF file that you simply integrate into your HTML page. Flash Page Flip can be controlled with some ActionScript codes. It can work with external files and set up through an XML file or PHP and ASP administrator panel. Flip through the book below by either clicking and dragging the pages from the corners in a page flipping motion or by clicking in the corner of each page. You may also flip to each page directly using the navigation below the book. Flash Page Flip coordinately works in all resolutions. By this feature, you can make your own publications in any size. 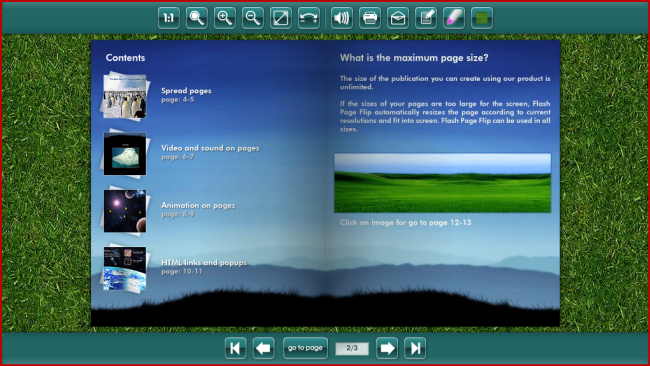 Flash Page Flip provides a wide space by Full Screen function. Flash Page Flip also provides an easy usage by lowing display quality in users own configurations. Colors of Flash Page Flip can be changed in order to writing hexadecimal color codes (#ffcc33 etc.) in XML files or PHP and ASP Administrator Panel. There is a language file in Flash Page Flip. You can use Flash Page Flip with a language you want by editting language file.